Elmer Schmidt made outstanding contributions as a player, administrator, promoter and builder over his many years of involvement with curling, however, Elmer will be remembered best for his dedication to Youth curling. Elmer was a director of the Caledonian Curling Club for 43 years including two terms as President. He was a driving force behind the designing and construction of the new Callie Club which opened in 1978. In 1974 he began coordinating the Regina High School Athletic curling program. In 1980 he became involved in the Regina Youth Bonspiel and in 1982 developed the “Curling for Kids” program for elementary school children. The program grew from 18 to over 100 teams. He was the President of the Association of Regina Curling Clubs from 1978 –1980. He was draw master of the Regina Men’s Bonspiel from 1972 – 1979. He was involved in many Provincial and National curling events held in Regina as a volunteer and served as General Manager of the 1992 Labatt Brier. Elmer also found time to curl for over thirty years, competing in bonspiels all over the province. He competed in many playdowns including 3 Provincial Mixed Championships. 1987 – SCA Scotty Richardson Award for outstanding contribution to curling. 1989 – Canadian Curling Association Award of Merit. 1992 – SCA Junior Coordinator of the Year. 2002 – Volunteer Award for Sport, Culture and Recreation Canada. 2004 – Canadian Curling Association Outstanding Achievement Award. 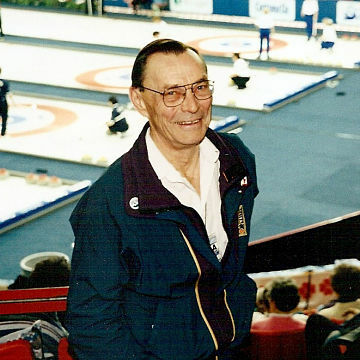 Elmer made outstanding contributions as a player, administrator, promoter and builder over his many years of involvement with curling and was active until his passing in July of 2008.